She tried to stay away from New York, but after 25 years above the Sullivan Street Theatre, it was unlikely that documentary photographer Jill Freedman could ever live elsewhere. God knows she tried. Miami Beach. All she really liked about it was the hammock she asked her landlord to string up outside her door, the sound and smell of the sea, the Cuban coffee and the 'No Germans' parking sign on her street. Then she moved near, but not to Gotham: the Hampton's, then Yonkers. Finally, she found an apartment overlooking Morningside Park and signed a lease. Persuading her back into a gallery was something of a hat trick: they tempted her with a storage space where they laid out the show and cataloged her work. The world turned up to find out why the gallery at 764 Mad Ave had sought her out and given her a photographic home base at Higher Pictures. when anybody who has ever worked with her finds her an irritating perfectionist, Freedman didn't want to compromise an inch. 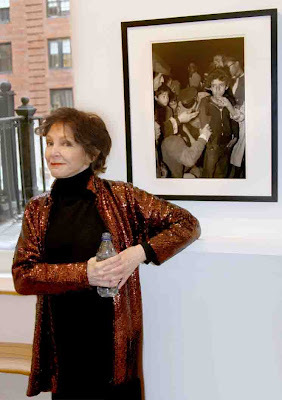 I was once walking with her on 18th Street in Miami Beach when she saw a picture of hers in a gallery window with the 'Opening Night' sign out. First, she tried to reason with the gallery owner. When that failed, she had a cop and a padlock there in minutes. She began with the Poor People's Campaign in Washington, DC and her first photo spread in LIFE magazine on the subject. COPS followed, and my interview with the most gorgeous earring-up NYPD hunka ever. CIRCUS meant spending months following the elephants. We once lost my dog, Baggins, on the Venice Beach boardwalk when Jill was shooting her famous JILL'S DOGS book: none of my dogs made the cut, but I still gave her a book party in my minuscule Manhattan garden. Freedman began a series on voluptuous flowers, but her roots in documentary kept tugging her home, as she describes herself" A New Yorker by way of Pittsburgh..."